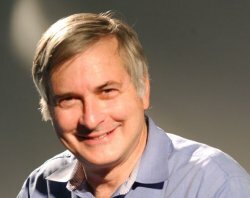 Seth Shostak is an American astronomer, born in Virginia, who is Senior Astronomer at the SETI Institute. His contributions to the public understanding and appreciation of astronomy led to him winning the Klumpke-Roberts Award by the Astronomical Society of the Pacific in 2004. Shostak received his BA in physics from Princeton University and PhD in astronomy from the California Institute of Technology. Before becoming involved with SETI, he carried out research in the motion of galaxies using radio telescopes in the United States and the Netherlands. He has been an observer for Project Phoenix and serves as Chair of the International Academy of Astronautics SETI Permanent Study Group. Shostak is responsible for many outreach activities associated with the SETI Institute. He is science editor for The Explorer, (a monthly publication for supporters of the Institute), talks regularly to academic and general audiences, and has written numerous magazine articles and several books about SETI. He is also host for the SETI Institute's weekly radio program Are We Alone?. 1. Life in the Universe, Jeffrey O. Bennett, Bruce Jakosky and Seth Shostak, 1980, ISBN 0385284586. 2. Sharing the Universe: Perspectives on Extraterrestrial Life, Seth Shostak, foreward by Frank Drake 1998, ISBN 0965377431. 3. Cosmic Company: The Search for Life in the Universe, Seth Shostak, Alex Barnett, 2003, ISBN 0521822335.